London, March 2 (CNA) Models of landmark works by Richard Rogers,a world-renowned British architect who won the prestigious PritzkerArchitecture Prize in 2007, will soon be exhibited in Taipei for thefirst time. The exhibition at Taipei Fine Arts Museum will feature detailedintroductions of 45 special architectural projects by Rogers and hispartners, which include the famous Parisian landmark the PompidouCenter and the distinctive London Millennium Dome. The collection will comprise 78 models and massive photographs aswell as 22 videos, a 50 meter-long chronology detailing Rogers'career history and four films especially produced for the exhibitionthat will be held at the Taipei museum from March 6-May 2. Rogers' company also designed R9 Central Park station of the massrapid transit system in the southern Taiwan port city of Kaohsiungand the Ching Fu Group Headquarters building in Kaohsiung, both ofwhich have become the city's new tourist attractions. Prior to his departure for Taipei along with his two seniorpartners Graham Stirk and Ivan Harbour, Rogers told the Central NewsAgency that he does not rely on instant inspiration to create hisdesigns but rather on a more slow-moving creative process. Rogers, noted for his modernist and functionalist works, said heneeds to understand the location and environment where the structurewill be built and the specific needs of the client. Asked about the secret to his career success, Rogers said he doesnot think there are any shortcuts to success which he said is more ofa culmination of effort over time. It requires teamwork because architecture is not only an art butalso a science, Rogers said. Architects cannot expect from the startto build a landmark structure because it takes time to shape up andincorporates many elements, he added. The 76-year-old Rogers further said he believes good architecturecan change the world and that a well-designed structure and publicspace can help inspire good human interactions. Rogers said he is gratified to visit Taiwan again. 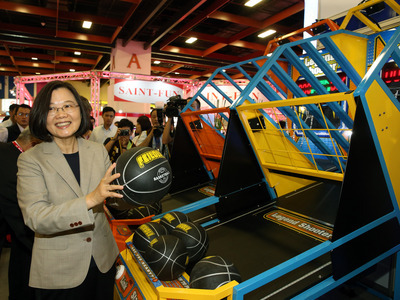 For him,Taiwan is a place that is full of vitality and vigor, he said, addingthat he was impressed by Taiwan cities' momentum for rapid change. Rogers' 45-year career took a big leap when he won the designcompetition for the Pompidou Centre in July 1971 with Piano,alongside a team from Ove Arup that included Irish engineer PeterRice. The building in Paris established Rogers's trademark of exposingmost of the building's services (water, heating and ventilationducts, and stairs) on the exterior and leaving the internal spacesuncluttered and open for visitors to the center's art exhibitions. This style, dubbed "Bowellism" by some critics, was notuniversally popular when the center opened in 1977, but today thePompidou Centre is a widely admired Parisian landmark. Rogersrevisited this inside-out style with his design for London's Lloyd'sBuilding, completed in 1984 -- another controversial design which hassince become a famous and distinctive landmark in its own right.